How did the RBMK control rod design cause an increase in reactivity when moved downwards? I have been trying to understand a particular aspect of the Chernobyl accident - the role of the graphite displacers on the end of the control rods. The basic story is that the graphite displacers caused the reactivity of the core to increase when the rods moved down, a non-intuitive effect that the operators were not expecting/sufficiently aware of. All literature I can find tells basically the same story, but I shall refer here to this PDF. On page 17 of that PDF it describes the graphite displacers and shows a schematic of a control rod in the raised position and in the "initial insertion" position. The graphic shows a control rod "extreme top" and "initial insertion" positions. In the second case the graphite has moved in the channel, displacing water there and increasing reactivity in the lower part of the core. The image has a "+" symbol showing this. Also, there is reduced reactivity above the displacer as a result of water replacing the graphite in that position, and reduced reactivity at the very top of the core due to the presence of the boron control rod. There are "-" symbols showing these effects. My question is, if the graphite displacer was already in the water column, how could moving it downwards change the overall reactivity of the core? Obviously the reactivity distribution changes, but it seems to me looking at the diagram that the (+) and (-) from the graphite movement would cancel out overall, leaving the (-) from the boron rod: an overall reduction in reactivity. This diagram should explain the basic problem. Prior to the accident, the control rods were in position II - that is to say, in the normal fully withdrawn position. The actual neutron absorber was sandwiched between two graphite displacer sections - so when the SCRAM button was pushed, the graphite displacer descended into the active region of the core and caused a localised spike in reactivity in the bottom of the core - the region which was most unstable. Edit for clarity: the design of the control rods at the time left a 1.25m column of water above and below the graphite displacer itself when in position III. I'm unsure of the exact state of the control rods immediately prior to the accident, but, in any case: it was very likely the lower 1.25m of the reactor which suffered the power excursion when the rods were inserted. This caused water in the lower part of the reactor to flash-boil to steam, damaging the reactor and causing the rods to become stuck, and in turn fed into a positive void coefficient, causing more water to boil, and so on and so on until a steam explosion blew the reactor apart. The RBMK is what's called a "loosely coupled" reactor, in part due to its size. Different parts of the core can have very different power levels, and the core was particularly dangerous at low power. 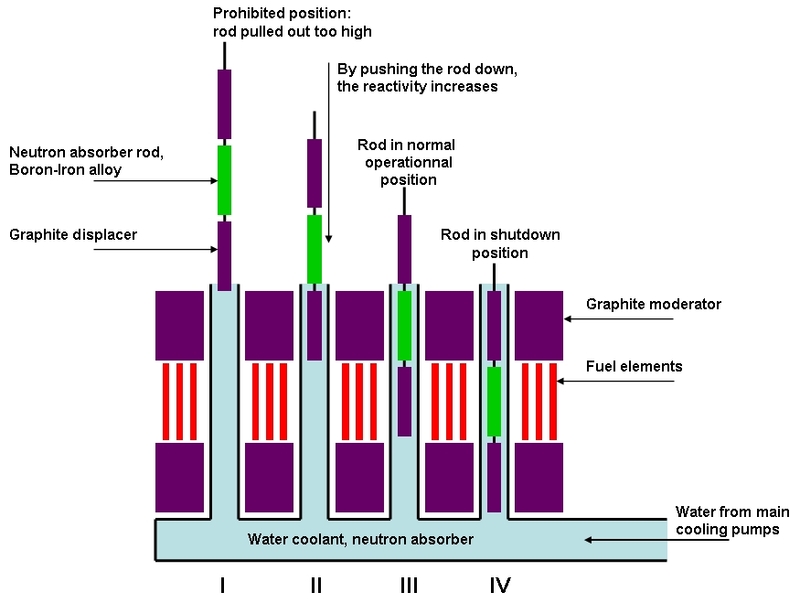 In any case, the control rod design was the final trigger on a sequence of events which destabilised the reactor - the design of the rods themselves was deeply unsafe and caused an increase in reactor power on insertion, and then a decrease. In Chernobyl-4's case, the rods never moved far enough into the core to stem the chain reaction. I read Chernousenko's book in the 90s (it's one of the references in the paper). If I remember correctly, he was one of the leads of the cleanup effort. It's a damning indictment of Gorbachov, the communist party, the people who designed the experiments while ignoring warnings of consequences, laziness on the part of the designers and deliberate inattention to safety in order to get the reactors operational as soon as possible. In the late 80s, I attended a presentation in Chicago given to the Ukrainian community by a nuclear engineer with extensive background in the area. His assessment was that this type of reactor was originally designed for plutonium production with power generation being an add-on. Not the answer you're looking for? Browse other questions tagged nuclear-engineering or ask your own question.